Register today at: https://attendee.gotowebinar.com/register/6830617413940098051. A recording of the webinar will be available afterwards. Upcoming webinar – How does food insecurity relate to health and what are the implications for health care providers? 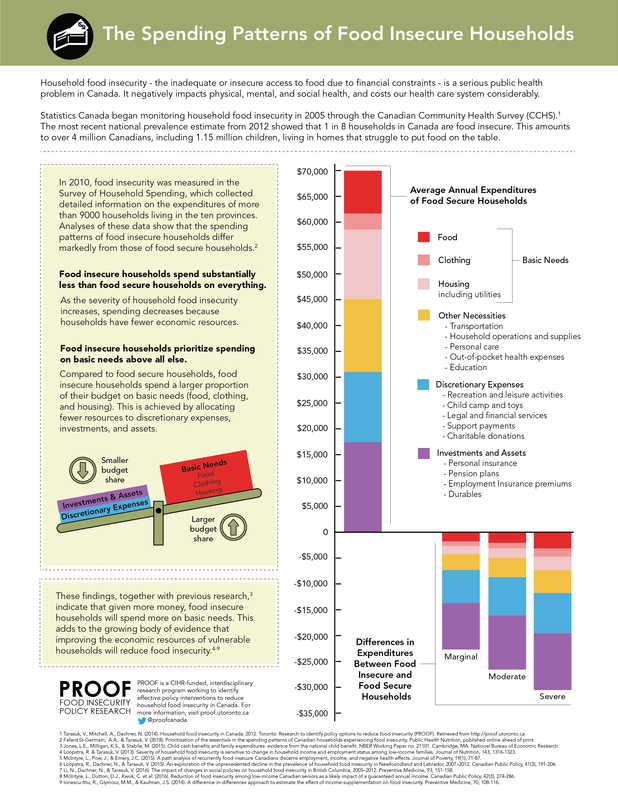 Please join PROOF and CDPAC for the final webinar in their series on household food insecurity. In this webinar, we will examine evidence of the impact of food insecurity on individuals’ mental and physical health and the financial burden food insecurity poses for our healthcare system. Although food insecurity is associated with dietary compromise, its effects on health extend beyond those associated with poor nutrition. We will discuss the complex relationship between food insecurity and health, considering the evidence of a bidirectional relationship for some conditions and disentangling the relation between food insecurity and malnutrition. Finally, we will examine the implications of this body of research for practice, particularly considering the challenges that arise in providing care to patients who are experiencing food insecurity. Register today at: https://attendee.gotowebinar.com/register/7992737431982570755. A recording of the webinar will be available afterwards. Please join PROOF and CDPAC for a second webinar on household food insecurity. 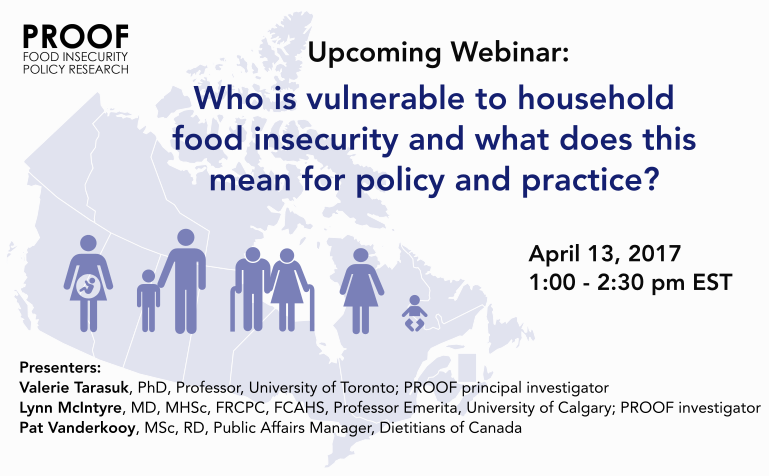 In this webinar, we will delve into the question of what drives vulnerability to household food insecurity in Canada. 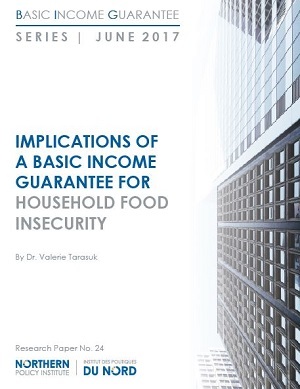 Drawing on the wealth of Canadian data collected during more than a decade of food insecurity monitoring, we will examine the social and economic circumstances of food insecure households and look at what has been found to underpin changes in household food insecurity status over time. We will also discuss the relationship between food insecurity and health, considering the evidence of a bidirectional relationship for some conditions. 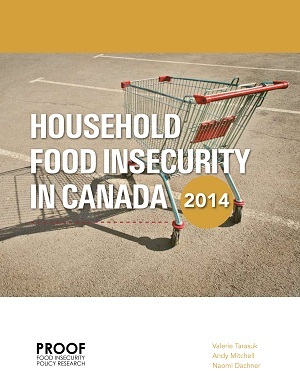 The interpretation of these findings by Dietitians of Canada in their recent Position Statement and Recommendations – Addressing Household Food Insecurity in Canada will also be shared as a platform for policy and practice recommendations. 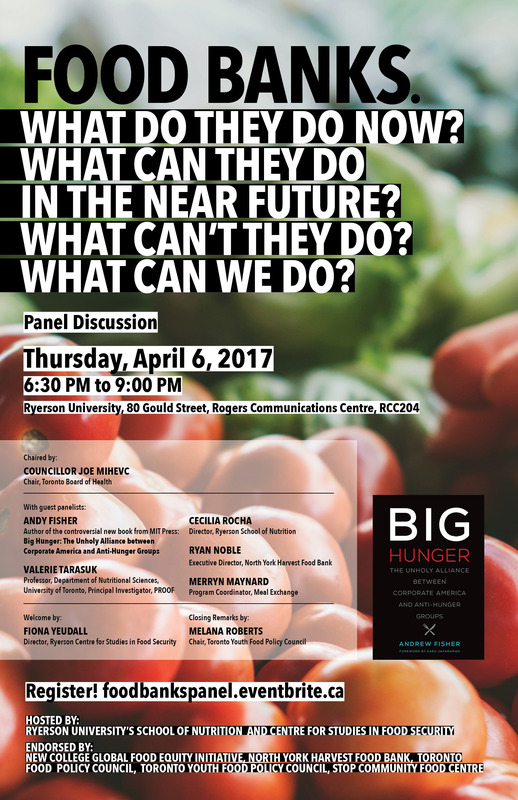 UPDATE: The panel discussion will now also be livestreamed at: https://ryecast.ryerson.ca/78/live/1601.aspx, starting at 7:00pm ET. A recording of the event will also be available afterwards. Join as a panel of outstanding experts and activists talk through the complex pros, cons, and to-dos of food banks. All points of view welcomed and respected. 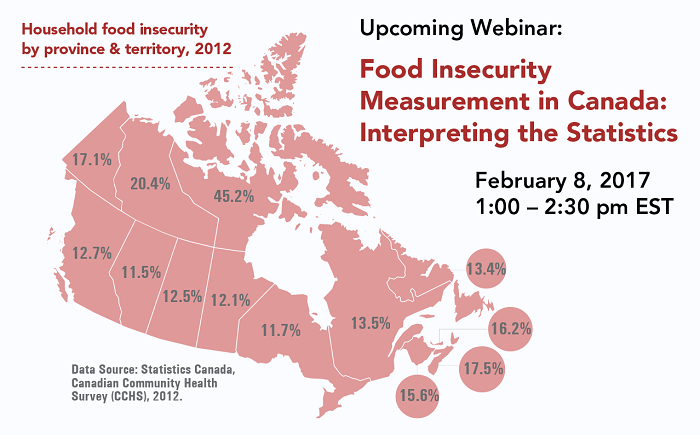 On February 8, 2017 from 1:00 – 2:30 pm EST, PROOF is co-hosting a webinar with Chronic Disease Prevention Alliance of Canada (CDPAC) on food insecurity measurement and statistics. For more information and to register, please visit: http://www.cdpac.ca/content.php?doc=369. A recording of the webinar will be available afterwards. The growing use of these data by public health, community agencies, research centres, and social policy groups has been critical in building awareness and understanding of the problem of food insecurity. However, inconsistencies and inaccuracies in the reporting of data on food insecurity mask the scale and severity of this problem. The accurate and effective use of Canada’s monitoring data hinges on a clear understanding of what exactly is being measured on the Canadian Community Health Survey, what it means, and how to interpret the food insecurity statistics available on Statistics Canada’s website (CANSIM). Anyone interested in using food insecurity statistics or learning about how food insecurity is monitored in Canada is encouraged to join.